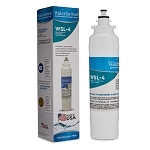 The WSF-2 (Frigidaire WF1CB/WFCB Compatible) Water Sentinel Water Filter Kit fits Frigidaire and Kenmore Energy Star compliant refrigerators made after April 2001 (WF1CB) where the filter is inside of a round plastic housing and has blue ends. Made in the U.S.A.
A: I buy these in quantity here for the best price I have found anywhere. My particular GE reefer has a warning light that comes on when the filter needs to be changed...but I have never been able to wait that long to change it. Before the lamp comes on, the cold water function output of my ice-maker slows to a trickle...indicating that the filter is full and needs to be changed. The mfg says that the filter should last six months, but this is directly dependent on how clean the water supply is. My forty year old mobile home park is supplied with iron pipe that is rusting. It shows up in my shower heads and sinks...and in my reefer cold water. 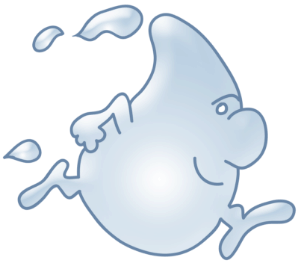 I use the filtered water for cooking, drinking and making coffee...so I change it when the water stream from the ice-maker dwindles. I hope this helps. 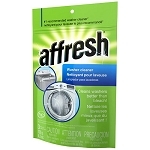 A: This filter should be replaced every 6 months according to the instructions on the label. A: Lasted 9 months. These are great filters. A: I can't answer that question since I just installed our first ones about two months ago. They work just the same as the factory ones. Our refrigerator has a light that comes on when it's time to replace the filter and I assume that is based on time elapsed rather than the performance of the filter. But we'll have to see if it comes on earlier with these. Sorry not to be able to help more. A: I tried them for their price and I hope they will compare in quality to the name brand filters we have purchased before. A: Best prices on high quality merchandise. Fast delivery. A: I'm not sure what you are asking. There is a small black o-ring on the filter.